Gold’s safe haven status was tested this week as Donald Trump’s economic war threatens to turn into a shooting war, with a number of global flash points getting hotter. 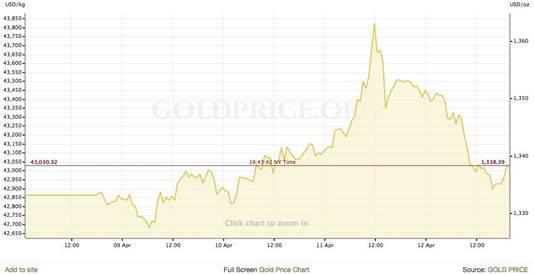 At the time of this writing the precious metal moved from a close of $1325.69 an ounce on April 5 to $1337.90 on April 12, dipping on Thursday after reaching a high of $1364.50 during Wednesday morning trading – the highest it’s been since Feb. 14. As we all know gold tends to do well in times of economic or political uncertainty, as well as verbal threats of any kind or movements that could signal civil unrest or war. 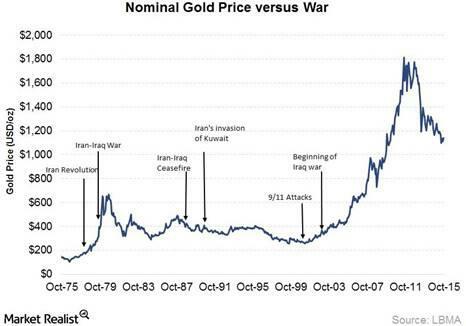 Market Realist published a good chart showing the effects of recent wars on the gold price going back 40 years to the 1978 Iranian revolution. The chart shows gold prices rising 23% in 1977, 37% in 1978 during the revolution, and 126% in 1979, a tumultuous year that included the Iranian hostage crisis, the Iran-Iraq war, and the Soviet invasion of Afghanistan. The threat of wars not only throws economic certainty into doubt, thus causing stock markets to dip, but also has a negative impact on the currencies of the countries involved. We see this right now with the US dollar index trading under 90 cents for all of this week as the possibility of military conflict ratchets up. Forex traders bid war-prone currencies down as they calculate the potential damage to infrastructure and a country’s short-term economic viability, which might cost governments and businesses billions. Rebuilding efforts would have to be financed with low interest rates, which further depresses the value of the currency. Gold and the dollar move in inverse directions, so rebuilding is good for gold. If a country has to print money and sell bonds to help finance a war or reconstruction, that will also cause gold to rise in value. History however tells us that while gold usually jumps in the run-up to a war, it soon returns to levels before it started to climb, especially if the threats don’t turn into action. If military action does result, the gold price usually softens after it becomes clear the conflict is unlikely to last long (such as the US invasion of Iraq in 2003) or once the war is over – as was the case after the end of the first Gulf War in 1991. The headlines this week have been full of escalations of continuing and new conflicts around the world. Here is a rundown. A month ago we warned that Russia threatened the US if it struck Damascus, following a rumored chemical weapons attack. On April 7 it happened, with reports of dozens injured or killed after bombs containing toxic chemicals were dropped on Douma, a rebel-held stronghold. On Sunday Trump held Russian President Vladimir Putin directly responsible, and suggested the US would strike back. Russia responded that the attack was faked and a provocation to justify Western intervention – an incredible position considering the easily accessible photos of gassed civilians seen foaming at the mouth and dead or injured children covered in rashes being treated with oxygen masks. The UN has documented 33 chemical attacks in Syria with 27 attributed to the Assad government, which denies using the weapons. A very similar attack to the one in Douma occurred a year ago in the town of Khan Sheikhoun, where sarin gas was used on civilians, after which Trump ordered a cruise missile strike on a Syrian air base. Trump recently said he wanted to bring 2,000 US troops home from Syria who are helping to defeat Islamic militants, which likely emboldened Assad. As the situation currently stands, the US, UK and France have agreed to collaborate on a military response; a US Navy guided-missile destroyer, the USS Donald Cook, is in the Mediterranean. French President Emmanuel Macron reportedly has proof the Syrian government launched the chemical attack, and UK Prime Minister Theresa May says she has Cabinet approval for military action. Russia has said that any missiles aimed at Russian forces will be shot down and their launch sites targeted. According to senior US military sources, Assad’s forces are moving aircraft in anticipation of missile attacks. On Friday night the U.S., U.K. and France fired 105 missiles at Syria, targets included chlorine and sarin gas research facilities. The war in Yemen, the Middle East’s poorest country, started in 2014 after Houthi rebels seized control of the capital, Sana’a. Saudi Arabia and a coalition of Arab countries responded with a military intervention in 2015 aimed at reinstalling the ousted government. Saudi-led air strikes have resulted in an estimated 10,000 dead and 40,000 wounded. The Saudis say the rebels are supplied weapons by Iran, the arch enemy of the Saudi Kingdom, an allegation the Iranians deny. On Wednesday Houthi rebels fired a Scud missile at Riyadh, and missiles were also fired at oil facilities belonging to state oil producer Aramco, Aljazeera reported. Two unmanned drones were shot down by the Saudi coalition. The Times also noted that Mohammed bin Salman has a good relationship with President Trump’s son-in-law and advisor Jared Kushner who is seeking to broker peace between Israel and the Palestinians. On the other hand, the Crown Prince appears to be playing both sides, with Riyadh and Moscow reportedly considering an agreement to extend oil price cuts for up to 20 years – something that would clearly benefit both countries especially Russia with its petroleum-dependent economy that has been hurt badly since the 2014 drop in oil prices. 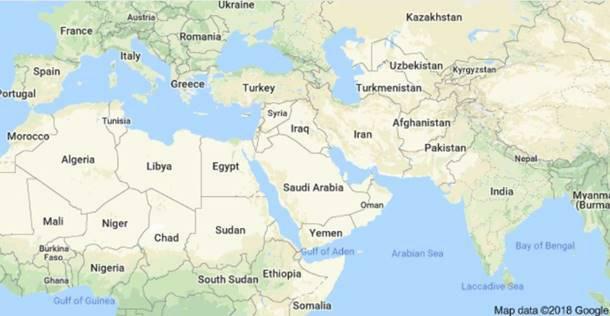 While the closer relationship on the face of it looks to be a step towards Middle East peace, it could also be a tactical move to gather support, including the strength of the Israeli Military, against Iran which it views as an aggressor in the region. The BBC notes that both countries oppose the Iran nuclear agreement and want to see tougher action against Iran especially in Syria. Shia-dominant Iran is believed to be spending billions to prop up Assad’s government by providing military advisors and weapons, plus lines of credit and oil transfers. Syria is also the main transit point for Iranian weapons shipped to Hezbollah, a Shia Islamist movement. Part of Trump’s rise to power in 2016 was a promise to tear up the Iranian nuclear agreement negotiated by former President Obama and five other majors powers – China, Russia, Britain, France and Germany. While the agreement has not yet been cancelled, Trump has said he will refuse to extend sanctions relief on Iran if Britain, France and Germany do not “fix the terrible flaws of the Iran nuclear deal”. If not, sanctions would resume on May 12, and the US may withdraw from the deal. Under its provisions, a waiver of sanctions must be issued every 120 days. When Trump waived sanctions in January, he also slapped “new sanctions on 14 Iranian individuals and entities that have committed human rights abuses or supported the country’s ballistic missile programs, which are outside the scope of the nuclear deal,” CNN reported. The situation appears to be heading towards a showdown where the US could both withdraw from the deal and impose sanctions. Nuclear experts quoted by Reuters said if Trump does not waive the sanctions in May, the nuclear deal is effectively dead. The United States last Friday took aim at rich Russian business leaders – the oligarchs – in the latest diplomatic shot fired at Putin for alleged Russian destabilizing activities, including interference in Western democratic elections in 2016 and 2017. The sanctions apply to seven oligarchs with ties to President Putin along with 12 companies they own or control. Seventeen senior Russian government officials were also sanctioned, along with Rosoboronexport, a weapons trading company with ties to Syria. The New York Times reports that the sanctions were especially painful for Oleg V. Deripaska and his aluminum giant, Rusal, which lost about one-third of its value on the Moscow stock exchange. According to the Treasury Department the oligarchs benefited from the Russian state’s “malign activities” around the world, the Times stated. In March the Trump Administration slapped sanctions on Russian government hackers and spy agencies for setting up Internet trolls to influence the result of the 2016 US election. More sanctions on Russia have also been proposed by the US after an alleged chemical attack on a former Russian spy and his daughter in the UK. Britain could also introduce sanctions, likely in concert with the EU, which implemented punitive measures aimed at Russian individuals and businesses following Russia’s invasion of Crimea. The US joined over 20 countries in expelling more than 100 diplomats and spies following the incident in Salisbury which left Russian double agent Sergei Skripal and his daughter Yulia in critical condition after being exposed to a nerve agent not used since World War II. Recent maneuvers in the South China Sea demonstrate that Beijing is willing to flex its muscles in a region it sees as strategically and economically important. Why the South China Sea? China is energy-starved and the areas off the coast of the Philippine province of Palawan are oil rich. Despite being rejected by the UN in 2016, China maintains it has control over the entire China South Sea Basin including crucial shipping lanes. 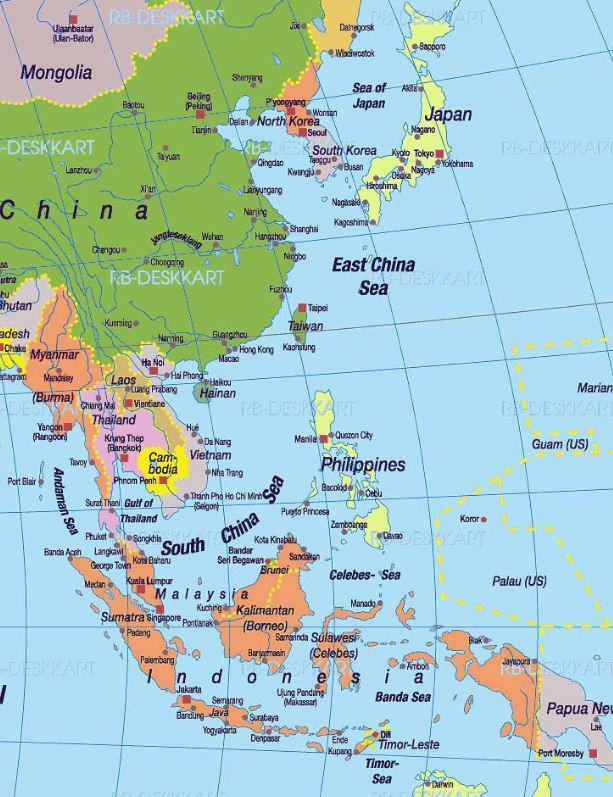 China’s territorial claims over the waters are disputed by its neighbors – the Philippines, Vietnam, Malaysia, Indonesia and Brunei. China’s growing dominance includes building military bases on new, reclaimed islands constructed from tiny rock outcrops jutting from the ocean surface. The United States has responded by sending US warships, refusing to register with air and maritime “identification zones” set up by the Chinese. There is also conflict in the East China Sea between China and Japan. At issue are disputed Islands (Senkakus to the Japanese, Diaoyu to China) and the fishing rights and natural resources those islands would deliver to their owner. In the Middle China Sea, there is China versus Taiwan, which China has claimed as its own ever since former Chinese President Chiang Kai-shek and his Kuomintang followers fled to the island in 1949. Beijing under the leadership of increasingly authoritarian President Xi Jinping’s (reappointed with no term limits) at the 19th Communist Party Congress said China must take control of Taiwan by 2050 at the latest, or as early as 2020 according to a recent article in the South China Morning Post. The latest show of force from China manifested in a large display of China’s naval might in the South China Sea this past week. The exercises included drills with 10,000 personnel including 48 naval vessels and 76 aircraft. The Chinese President was there to witness the drills – a clear indication of their importance to Xi Jinping – dressed in camouflage military fatigues aboard a Chinese destroyer. Xi aims to modernize the Chinese Military, by boosting military spending, launching its first domestic aircraft carrier, and rolling out a new stealth fighter – the J-20. The Chinese military exercises were countered by the presence of the USS Theodore Roosevelt aircraft carrier, which led a carrier strike group en route to a port of call in the Philippines – a US ally. The US seeks to defend freedom of navigation through the $5-trillion annual maritime trade corridor. China and Russia have been allies since the 1950s when they agreed to defend one another against an attack from US-backed Japan or its allies (China backed North Vietnam and North Korea) so continued cooperation is unsurprising. In 2001 Vladimir Putin and then-Chinese President Jiang Zemin signed a 20-year agreement to “increase trust between their militaries”. The two countries now regularly participate in joint maneuvers including joint naval exercises to counter US influence in the Asia Pacific region. Economic ties are also growing closer. On New Year’s Day a second Sino-Russian oil pipeline began operating, doubling the amount of Russian crude being shipped to China, while in 2014 Beijing and Moscow signed a 30-year, $400-billion deal for Gazprom to deliver gas to China. Last summer Xi Jinping and Vladimir Putin met in Russia to sign a deal whereby two Russian banks and a Chinese bank created a $10-billion investment fund that will finance infrastructure and development projects, and an $850 million innovation fund. The Russian banks are subject to US sanctions so the deal allows Russia to access non-Western capital, and to conduct transactions in yuan or rubles. Of course one of the hottest points of global conflict is North Korea. Up to the February 2018 Olympics in South Korea, Trump and North Korea’s Kim Jong-un exchanged a series of very public threats and personal insults after the reclusive nation successfully tested its first intercontinental ballistic missile capable of hitting the US mainland. The Olympics however seemed to soften the rhetoric, with Kim sending a team to compete at Pyeongchang and his sister, Kim Yo Jong, to represent the North. In a surprise show of diplomacy, Trump has agreed to meet Kim Jong-un in person, something that has never been done by a sitting US President. The goal is clearly to negotiate the denuclearization of North Korea, but the question is, at what price? What concessions will Kim try to extract from Trump when the two meet in June at a still undetermined location? While the two leaders talking looks to be a sign of warming relations, the outcome of the meeting could also further destabilize the region which is still technically at war. The Korean War ended in 1953 with an armistice and the creation of the demilitarized zone (the DMZ), but no peace treaty was signed. Could a trade war escalate into a shooting war? US President Donald Trump shocked the world into a state of disbelief with a series of rounds of tariff threats (so far $150 billion) mostly aimed at China, which the President views as his chief economic nemesis. China, Trump believes, has artificially kept its currency low to keep exports cheap, perpetuated a trade balance that last had the US staring into a $375 billion deficit with China, subsidized its steel industry, and stolen US intellectual property by requiring American companies to hand over its IP as a condition of accessing the 1.3 billion population Chinese market. Ray Dalio, an American billionaire and founder of investment firm Bridgewater Associates, one of the world’s largest hedge funds, wrote in a recent column that he thinks “the odds have increased” of the trade war turning into something bigger. Dalio also references Graham Allison’s Destined for War: Can America and China Escape Thucydides’s Trap? The world has become a much more dangerous place in the last few weeks. Between competing naval exercises in the South China Sea, a chemical weapons attack in Syria, US and European sanctions on Russia, a likely showdown over the Iran nuclear deal, and a host of other (ie. India v Pakistan) conflicts not even mentioned here, investors have reason to turn to safe-haven assets – and gold has benefited. At the same time the dollar continues to trade under 90 cents against a basket of other currencies, which is also good for gold, and until there is clarity on whether the threatened tariffs will come to fruition, or a trade deal between China and the US is reached, we expect the greenback to slump. Threats of war are always factored into the safe-haven value of gold on any given day, but we may be witnessing a sea-change where it is difficult to imagine a return to any sense of normalcy anytime soon – especially given Trump’s determination to put America’s interests first despite ruffling a lot of feathers with both allies and adversaries. While this is troubling, it’s also a good time to be in gold and gold companies, whose fortunes of course rise and fall with the gold price. As I keep a close eye on rising geopolitical tensions I’ve got golden junior resource companies on my radar screen. Do you? Multiple fronts against multiple enemies = No war !